Most college students’ hijinks are dumb and destructive. Toilet papering a building? Yawn. Streaking through campus? Mildly amusing at best. But a University Of Houston student’s recent prank on a local McDonald’s is not only slickly executed, but actually makes a point. 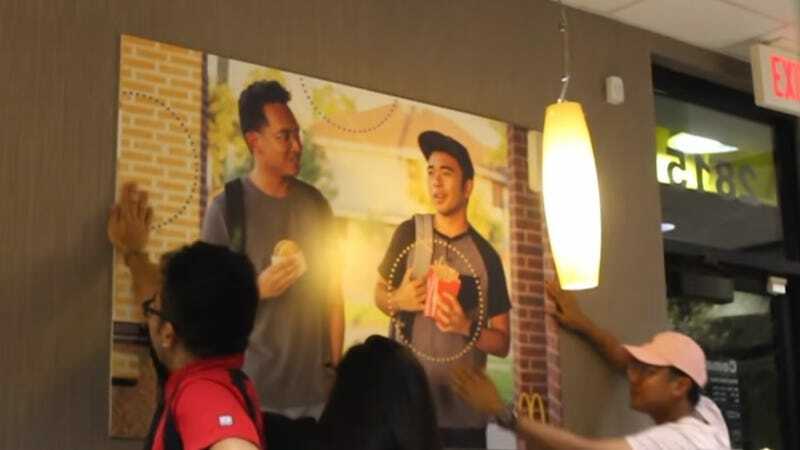 The student, identified as Jevh M. on social media, created a fake advertising poster for McDonald’s featuring himself and his friend. They blew up the photo, printed it the size of a large poster, bought McD’s uniforms at a second-hand store so they could pose as employees, and hung the poster in the Parkland, Texas, McDonald’s. According to Jevh’s tweet, it’s been hanging there for 51 days. Jevh should be majoring in graphic design or advertising or something, because the kid has some design skills. And change it they did, for at least 51 days. There’s no word yet on whether Jevh’s poster is still hanging in the McDonald’s after his story blew up; here’s hoping the restaurant takes it all in stride. Maybe the company has a marketing intern position that needs filling?